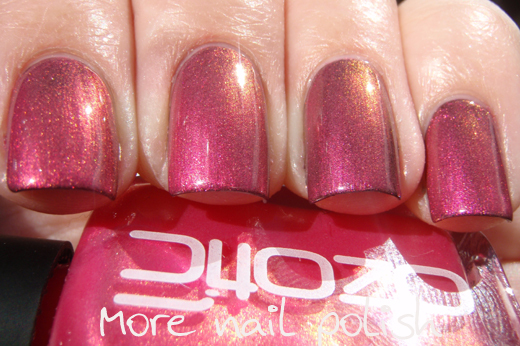 Here is a candy pink duo-chrome polish to warm up your cold winter's day. 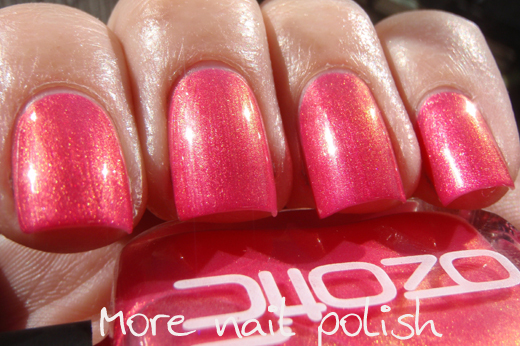 Or for you ladies in the northern hemisphere enjoying summer, a nice bright summery duo-chrome. 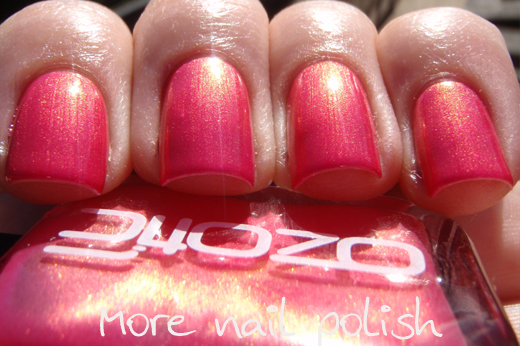 Ozotic 757 is a bright pink polish with a gorgeous golden duo-chrome shift. It has good opacity at two coats and covers the nail perfectly. It's not frosty but has a really pretty bright silvery blue shimmer. It's the blue shimmer that shifts to gold. While it is opaque on it's own at two coats, it's still can be worn over black to bring out a darker pink shimmer and stronger gold shift. This is two coats over black. Layered over white, this pink polish nearly becomes a neon. I love a verstile polish that can be worn multiple ways. Glitter polishes are like that, but I love it when you can find a shimmer polish that can look very different depending on what you layer it over. I'm not a huge pink polish fan, but this is a fun colour and will definitely make a comeback for me in spring. I can just imagine stamping on this already. Wow, that's amazing. I don't think I've ever seen a duochrome that shifts like that before! That looks like a nice base for stamping. Did you order the new Bundle Monster plates? Thanks for another awesome post. We love your blog!